Samurai - the Japanese campaign will feature the establishment of the Tokugawa Shogunate. A really unique feature of the Japanese civilization is that they cannot gather food from hunting. This is because during the time-period of The Asian Dynasties, there was a ban on eating meat other than fish. This is mirrored in the game by forcing Japanese players to gather food from berries, fish or farms only. However, the player has an additional option of building Shrines, buildings that attract local wildlife, which will boost gathering rates for the player. Enemy players will be unable to hunt animals currently at a Shrine - they must destroy the Shrine first. Another unique ability is that many Japanese homecity cards can be sent twice. While they and all Asian civilizations lack the three-villager card that is so popular with most Age players, they have the capacity to send the two-villager card twice. This two-sending ability will make for interesting strategies early on, as players weigh their options in the early game. Japan also has an impressive set of mercenary shipments at their disposal, which will certainly become an important part of many strategies. Japan also has a solid start that can be used to attack an enemy hard and early. This is mainly due to the Daimyo unit, which can be used to ship units directly to him or to create units like a mobile barracks. 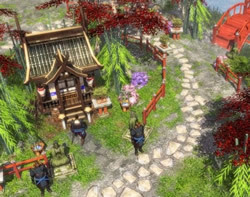 The Daimyo is also a tough fighter and provides an attack bonus to nearby units. The Japanese also have one of the best economies in the game. The shrines allow for improved resource production and potentially allow for fewer population slots to be used for economy and more for military. The shrines are built by monks and also serve as housing. Once they begin to attract wildlife and herd animals, their extensive resource gathering boost will be even more appreciated. One of the Japanese wonders, the Toshogu Shrine, enhances the other shrines and acts as a large shrine itself. Shrines can also receive a boost from the homecity card Heavenly Kami, which increase shrine line of sight and hitpoints, reduces their cost, and increases the amount of resources they generate. In team games, Japanese allies enjoy the benefits of the civilization's wonders. In particular, the Giant Buddha wonder grants the informers power, allowing players to see the location of enemy units for a short time. There are also a few team cards in the Japanese decks that any ally will appreciate, such as fishing boats, cheaper unit upgrades, and even ninjas.